Liturgical Instruction: According to Galician usage, we continue to sing the First Antiphon of Pascha and the Third Antiphon, “Come, let us sing joyfully to the Lord” with the refrain “Son of God, risen from the dead,” until the eve of Ascension. After the priest exclaims “Blessed is the Kingdom” and we have responded “Amen,” the clergy sing the following Tropar once and the people repeat it. Then the clergy sing the first half, and we conclude it. This is done every day until the Wednesday before Ascension Thursday. 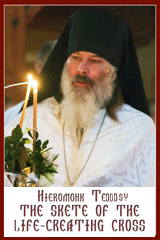 Troparion (Tone 3): Let the heavens be glad, let the earth rejoice,* for the Lord has done a mighty deed with his arm. * He trampled death by death; He became the first born of the dead;* He saved us from the abyss of Hades* and granted great mercy to the world. 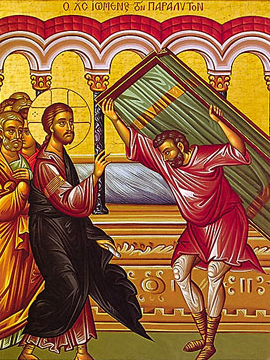 Kontakion (Tone 3): Lord, as of old You raised the Paralytic,* lift my soul by Your divine presence,* for by my many sins and foolish actions,* I, too, am now afflicted and crippled. * Raise me, that being saved I may cry to You:* Glory to Your power, O merciful Christ. 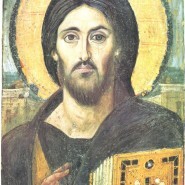 Prokimenon (Tone 1): Let Your mercy, O Lord, be upon us* as we have hoped in You (Ps 32:22). verse: Rejoice in the Lord, O you just; praise befits the righteous (Ps 32:1). Epistle (Acts 9:32-42): In those days Peter went here and there among all the believers, he came down also to the saints living in Lydda. There he found a man named Aeneas, who had been bedridden for eight years, for he was paralysed. Peter said to him, ‘Aeneas, Jesus Christ heals you; get up and make your bed!’ And immediately he got up. And all the residents of Lydda and Sharon saw him and turned to the Lord. Now in Joppa there was a disciple whose name was Tabitha, which in Greek is Dorcas. She was devoted to good works and acts of charity. At that time she became ill and died. When they had washed her, they laid her in a room upstairs. Since Lydda was near Joppa, the disciples, who heard that Peter was there, sent two men to him with the request, ‘Please come to us without delay.’ So Peter got up and went with them; and when he arrived, they took him to the room upstairs. All the widows stood beside him, weeping and showing tunics and other clothing that Dorcas had made while she was with them. Peter put all of them outside, and then he knelt down and prayed. He turned to the body and said, ‘Tabitha, get up.’ Then she opened her eyes, and seeing Peter, she sat up. He gave her his hand and helped her up. Then calling the saints and widows, he showed her to be alive. This became known throughout Joppa, and many believed in the Lord. verse: Of Your mercies, O Lord, I will sing forever; with my mouth I will proclaim Your truth from generation to generation (Ps 88:2). verse: For You have said, “Mercy will be estabished forever” (Ps 88:3). Gospel: (John 5:1-15): At that time Jesus went up to Jerusalem. Now in Jerusalem by the Sheep Gate there is a pool, called in Hebrew Beth-zatha, which has five porticoes. In these lay many invalids—blind, lame, and paralysed, waiting for the moving of the water. For an angel went down at a certain time into the pool and stirred up the water; then whoever stepped in first, after the stirring of the water, was made well of whatever disease he had. One man was there who had been ill for thirty-eight years. When Jesus saw him lying there and knew that he had been there a long time, he said to him, ‘Do you want to be made well?’ The sick man answered him, ‘Sir, I have no one to put me into the pool when the water is stirred up; and while I am making my way, someone else steps down ahead of me.’ Jesus said to him, ‘Stand up, take your mat and walk.’ At once the man was made well, and he took up his mat and began to walk. Now that day was a sabbath. So the Jews said to the man who had been cured, ‘It is the sabbath; it is not lawful for you to carry your mat.’ But he answered them, ‘The man who made me well said to me, “Take up your mat and walk.” ’ They asked him, ‘Who is the man who said to you, “Take it up and walk”?’ Now the man who had been healed did not know who it was, for Jesus had disappeared in the crowd that was there. Later Jesus found him in the temple and said to him, ‘See, you have been made well! Do not sin any more, so that nothing worse happens to you.’ The man went away and told the Jews that it was Jesus who had made him well. Communion Verse: Receive the Body of Christ;* taste the fountain of immortality. Second Communion Verse: Praise the Lord from the heavens;* praise Him in the highest (Ps 148:1). Alleluia! (3x).